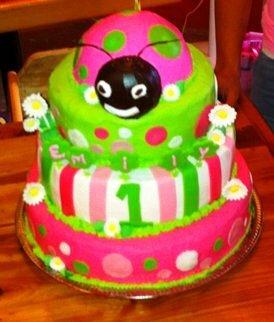 I made this Ladybug cake for my Granddaughter Emily's 1st Birthday. Iced with Butter cream Frosting on the cake and Fondant for the circles and stripes. The bottom layer is white with green butter cream fill, second layer is strawberry with strawberry fill and the top and lady bug is chocolate with chocolate fill. It was fun to make and everyone loved it. Click Here for Ladybug Party Ideas!